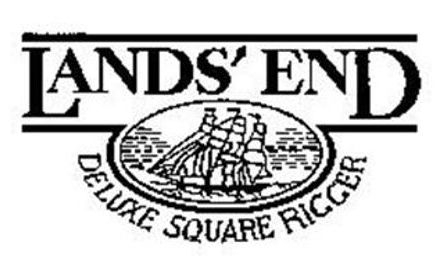 It’s entirely a matter of speculation, but I highly doubt that Lawrence Kudlow, economist extraordinaire and financial adviser-at-large, has ever gotten over the end of the Square Rigger from Lands’ End, the catalog retailer now owned by Sears. He stated up-front and early-on his dread for the fate of this great company. The day that I heard Sears had bought Lands’ End for 2 billion US dollars was in the summer of 2002, sometime in June. The first thing that I did was to cut my losses. 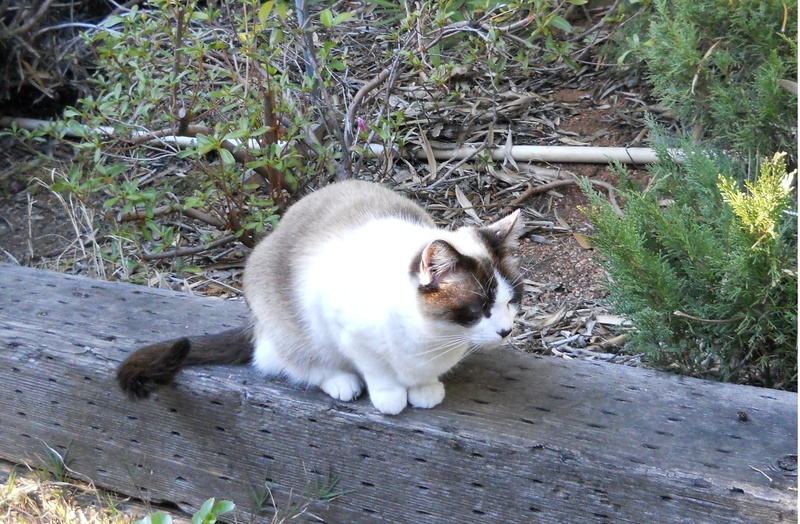 I mourned the demise of a wonderful, superbly wonderful seller of clothing for myself, my husband, and my children, and I grieved the passing of a fantastic purveyor of bedding, some of which I’ve only recently put to use in the garage. I kept a violets-and-clover print sheet set from Lands’ End for the better part of twenty years. I’ve yet to see percale that pristine, soft and staunch. Blast any 500-thread-count! It’s what the thread is made of that counts! The next action I undertook after hearing that funereal news in June 2002 was to undertake a wake, and perform some immediate retail therapy. I purchased four more beach towels from Lands’ End, since the ones I’d purchased from this catalog company in 1992 were starting to show their age. The replacement towels I still own, but, when I compared those newer towels of 2002 with the ones from 1992, I identified a distressing decline in quality and a definite reduction in size. Those indicators were harbingers of things to come! I discussed this horrible turn of events with a few friends, who also felt stunned. They too foresaw the deterioration of this company. 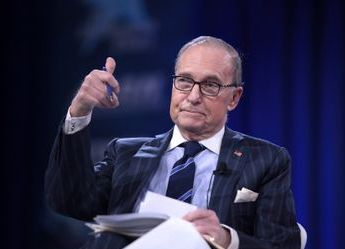 And then I saw, while flipping through channels on the TV, Lawrence Kudlow on CNBC. He was visibly shaken. He stated that They’d better not get rid of the Square Rigger. Well, of course, Mr. Kudlow, They did. 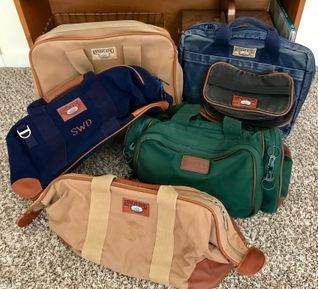 Vintage Square Riggers are now available for sale online, all over, in fact. I’ve recently become the happy happy recipient of a few of them for birthday presents. I’ve also given one or two away as Christmas gifts. Additionally, I use a monogrammed Square Rigger that once belonged to RM (Dear Husband). The satchel-briefcase comes in very handy for packing around reference materials for fiction. 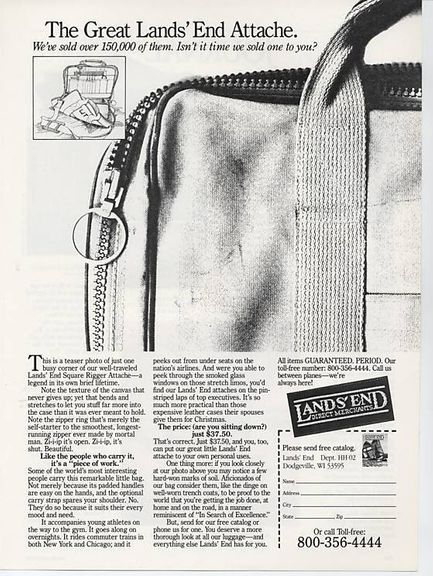 The Square Rigger was a canvas construction with a big, gorgeously big, sturdy zipper and more compartments than the average person knew what to do with. 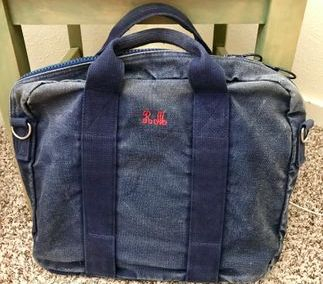 It was a design original for Lands’ End. The Square Rigger was emblematic of everything right with that company, a family-owned business that bit the dust when the family decided to sell the farm to Sears, a company that has become synonymous with the anti-Midas touch. Its touch on “Lands’ End” is almost fatal. Sears even messed up the Land’s End logo and the label. I’m not sure if Mr. Kudlow would appreciate a vintage Square Rigger, but he’d better get them before they’re all gone! As for me, I’m full up with five Square Riggers. Having sounded the all hands on deck, here, I hope that your finds are filled with the joy that once was Lands’ End!